You cannot look at these cards. When the Patrol deck is exhausted, include the removed cards and discard that many again after the deck has been reshuffled. Note: Some events and characters require teamwork and don't work with one-player games. This is a good training mission for the team - steal plans from a high-tech office building. Build a two-floor building using all the same rules, but only include the tiles that have the white circle around the number in the bottom right. (28 tiles + 2 Safes + 2 Stairs). Set the walls according to the diagram. Set the Guard on the 1st floor to 2 movement and the 2nd floor to 3 movement. This is a very different layout - two 5x5 floors. To set this up, first remove 2 Safe and 2 Stairs tiles and shuffle the remaining tiles. Split them into two equal piles and then add a Safe and Stairs tile to each pile. Shuffle each pile and lay them both out face down in a 5x5 grid. Each floor will have one empty spot which must be in the same spot on both floors. Players can choose where the empty spot is located. Take 12 walls per floor and place them between tiles (refer to the Advanced Wall Layouts section). The empty spot acts as an outer wall and is impassable. To set up the patrol decks, divide the patrol cards into two piles, then cards then shuffle (those with a white circle are for the first floor and those with a black circle are for the second). When revealing Patrol cards, if a card has a red triangle, this is the indicated tile (instead of the highlighted square). Set the Guard on the 1st floor to 3 movement and the 2nd floor to 4 movement. To win you must crack all 3 safes, (each safe having 7 or 8 numbers in the combination) and escape to the roof from the second floor with loot in hand. Any cracked tokens on a tile shared by two safes counts toward both. In the heat of the moment, the team can lose track of where the Guard is. This can lead to some bad surprises. To play with the Lost Visual cards, shuffle one into each Patrol deck. When a Lost Visual card is drawn during the game, the Guard loses the rest of his movement and is removed from the board. The next player's turn where the Guard is supposed to move on that floor, draw the next Patrol card and place him there. Draw a second card to determine his new destination. ATRIUM: You may peek up or down from this tile. Guards can see into this tile from above or below, making you lose a Stealth. CAMERA: Guards on a Camera tile see all the other revealed tiles that are cameras, on any floor. You do not lose Stealth, but they remotely trigger an Alarm on your tile (by calling on their radio). Note that Guards can see through Cameras when moving through a Camera on their turn. COMPUTER ROOM: There are 3 Computer Rooms cor- responding to Fingerprint, Laser, and Motion tiles. Players may spend an action here to put a token on it. Each time a player encounters a tile that matches the name on this Computer Room (Fingerprint, Laser, or Motion), they can spend one of these tokens to prevent an Alarm from triggering. It's important to build up tokens to prevent trouble later. DEADBOLT: If a player (or Guard) is not on this tile, it takes 3 actions to enter. If you can't pay the extra actions, you stay in the tile you came from. FINGERPRINT: Fingerprint is the trickiest Alarm. An Alarm goes off when you enter unless you spend a Hack token from the Fingerprint Computer Room. FOYER: Guards can see into this tile from adjacent tiles, but not through walls. You will lose a Stealth if a Guard is an adjacent tile. You will lose another Stealth if the Guards enter the your tile, as per normal. KEYPAD: When moving into a Keypad tile, you must guess the code. Take a die and roll it. If it is a 6, you enter the tile. If not, you will have to stay in the tile you came from. Once you roll a 6, put an open marker on the tile - any team member can enter freely now that code is known. For each attempt after the first (in a single turn), roll 1 more die. I.e., on the fourth attempt in a single turn you would roll 4 dice, but the next turn you would start back at 1 die. If you start the game or fall into this room, you may leave but must open it to get back in. LABORATORY: First player to enter this tile draws a tool card. LASER: It takes two actions to enter this tile. If you can't or don't want to spend the extra action, an Alarm goes off un- less you use a Hack token from the Laser Computer Room. LAVATORY: This room has 3 stalls to hide in. When this tile is revealed, place 3 Stealth tokens on it. Players may use these tokens as Stealth while they are on this tile, instead of their own. The tokens cannot be picked up by players. MOTION: You cannot enter AND leave this tile in one turn. You must stop here. If you don't, you trigger an alarm unless you use a Hack token from the Motion Computer Room. SAFE: Safes are the goal. Roll the combination to open them (see "Cracking" above). When opened, draw a Tool, draw a Loot, and increase the Guard's movement die by one on this floor and all those below it. SCANNER: If you are holding a Tool or Loot when you enter this tile, an Alarm goes off. SECRET DOOR: You may move into this tile through walls adjacent to this tile. This is one-way; you can't move or peek back out through a wall. Guards will not move through secret doors. SERVICE DUCT: Once both Ducts have been discovered, they act as a teleporter. 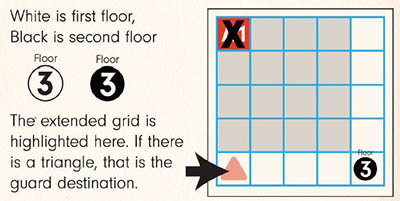 Players may move between them for one action, regardless of what floors they are on. STAIRS: Stairs allow you to move directly up one floor. Put a Downstairs token on the corresponding tile one floor up (I.e.2ndrow, 3rdcolumn). You can also peek upstairs and come back downstairs. It takes 1 action to take the stairs to the roof at the end of the game. THERMO: If you end your actions on a Thermo tile an Alarm will go off. If you are moved here during other turns, it does not trigger. WALKWAY: If this tile is revealed by moving into it, that player falls 1 floor. When falling, it does not count as entering that tile. If you are on the bottom floor, nothing happens. Any players that enter after it is revealed do not fall, but can move downstairs for an action (this does count as entering). This is one-way; you cannot move up to this tile from below.